Mid-century modern in Sarasota, Fla.
Modern-day Sarasota is known for its thriving arts scene and contemporary homes and offices, but what many people don’t know is that sprinkled among the new buildings are world famous examples of another modern movement, which I wrote about last month for a Florida website after Lina and I visited there in December. The Sarasota School of Architecture came of age in the early 1940s and continued through the mid 1960s, and many examples remain. “Unlike many historical buildings, their beauty isn’t encompassed in rich ornamental details, but in integrating post-war design with how to live in the tropics,” said Lorrie Muldowney, Sarasota County’s historic preservation specialist. Making these older homes even more relevant today are the properties they share with current “green” or sustainable design — natural air flow, passive design, connecting the inside to the outside, and native-plant landscaping. 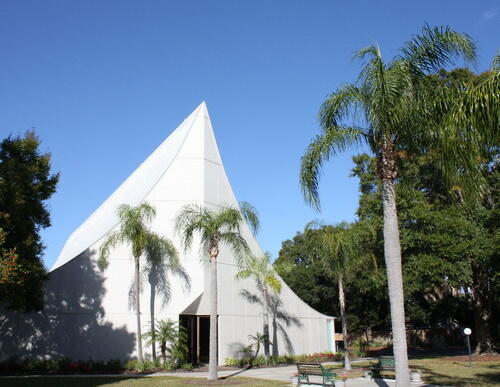 Leading the Sarasota School were architects and designers Philip Hiss, Paul Rudolph and his one-time partner Ralph Twitchell, Victor Lundy, and Jack West. Hiss first developed the neighborhood of Lido Shores (just off busy St. Armands Circle), which still contains the highest concentration of Sarasota School homes. To start your study in Sarasota School architecture, here are some of the most interesting and accessible stops from the guidebook “Tour Sarasota Architecture,” available free of charge at the Sarasota Convention & Visitors Bureau. 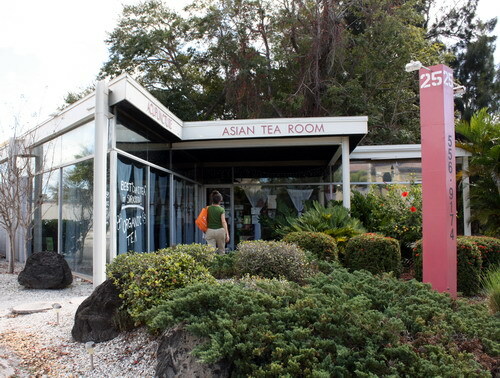 Next door to the Umbrella House is Hiss’s original studio, a glass rectangle raised on steel columns that was one of the first air-conditioned spaces in Sarasota. While you’re in Lido Shores, use the “Tour Sarasota Architecture” guide to walk or drive by more than a dozen other Sarasota School homes. Sarasota City Hall (1966), 1565 1st St.
Joe Barth Insurance Office (1957), 25 S. Osprey Ave.
St. Paul Lutheran Church Fellowship Hall (1959) and Sanctuary (1968), 2256 Bahia Vista St.
Parish administrator Arleen Austin is accustomed to receiving visitors. “We get tourists from all over the world familiar with Victory Lundy and wanting to see his architecture.” Admirers are drawn to the simple, soaring lines of both buildings and to the altar wall, dramatically lit by window slits along the tall sloping roof. 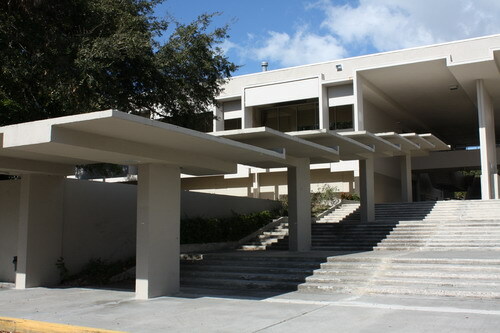 Sarasota High School Addition (1960), 1000 School Ave. Architect Paul Rudolph designed many public buildings. Sarasota and the former Riverview high schools were among the best known. After much outcry, Riverview, beset with maintenance issues, was demolished in 2009. Meanwhile, the addition Rudolph designed here is not only intact but getting a needed renovation in 2012, said administrative assistant Lyn Campbell. The minimalist all-white structure includes large openings for ventilation, raised floor levels, and shaded areas on the stairs. Walk to the back to this serenely sited neighborhood center to see Victor Lundy’s large, sleek glass room with newly restored terrazzo floors, used as a social hall. “This is a well loved building,” said manager Dan Beswick. Next on his wish list is to remove the acoustical tile ceiling and restore the original pine. The center, set on five acres along Phillippi Creek, is also a perfect picnic spot. With your tour complete, you may be in the mood for some mid-century modern merchandise. If so, Jack Vinales Antiques, 500 S. Pineapple Ave., is the place to shop. Vinales, in business since 1992, stocks furniture, dinnerware, jewelry, and art from the 1930s through the 1960s, with a specialty in mid-century furnishings and lighting. This entry was posted on February 12, 2012 at 8:31 pm and is filed under Art, Florida, Road travel. You can follow any responses to this entry through the RSS 2.0 feed. You can leave a response, or trackback from your own site. Well done! 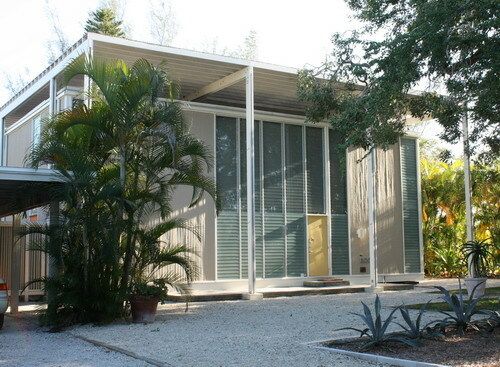 Thanks for this post on the Sarasota School of Architecture and Sarasota’s historic modern architecture. Thanks, Martie. Thank you for all you’ve done to save and beautify so many buildings!